NEWARK, N.J. — Stacy Tyndall is exactly the kind of person the city of Newark hopes will stick around. She’s smart, ambitious and involved in the community. But the high-poverty city near New York probably would have lost her to another part of the country were it not for an innovative two-year-old honors program on Rutgers University’s Newark campus. Tyndall turned down a bevy of offers from colleges in other states to attend Rutgers’ Honors Living-Learning Community (HLLC), which brings together dozens of students each year for a residential program that combines rigorous academics with a social-justice focus. The HLLC is one of two on-campus programs offering ambitious students from the Newark area a reason to stay close to home. The other program, the Honors College, has existed for decades; in 2016 it retooled its admissions strategy to attract students with a wider range of academic interests. Both programs are expanding as public universities nationwide start — or tweak — honors curricula to compete with selective private colleges for top students. Among Rutgers’ goals is boosting the educational fortunes of a city that has some of the lowest rates of college attainment nationwide. According to the U.S. Census Bureau, fewer than 14 percent of Newark residents 25 or older have a bachelor’s degree — less than half the national average. And just 4 percent of city residents hold a graduate degree, compared to 12 percent nationally. That lack of attainment is perhaps not surprising: Until last year, Newark’s public schools had been under state control since 1995, when a state investigation revealed school environments that “virtually assure academic failure.” In September, after Newark students showed academic gains, New Jersey education officials voted to return control of the city’s public schools to the local school board, 22 years after the state Board of Education took over the tattered district. Rutgers leaders hope that by offering competitive honors programs for students with a passion for equality and justice, they can attract more of the public schools’ top performers and encourage them to stay put to help combat the city’s problems. Both HLLC and Honors College leaders say they’ve been impressed by the academic abilities and social consciousness of local applicants. Overall, the campus has attracted nearly 60 percent more students from Newark since 2013, the result of a concerted effort by Rutgers and other local groups to boost college-going rates in the city, university officials said. “We definitely want Newark students to feel like this is a place where they can come and succeed,” said Nancy Cantor, chancellor of Rutgers-Newark, which is playing a key role in the local drive to boost the share of city residents who hold college degrees and other post-secondary credentials from 12.2 percent in 2000 to 25 percent by 2025. 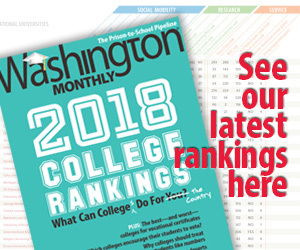 College honors programs, which typically give top academic performers access to a supplemental curriculum and other benefits, have been around for almost a century, but their numbers have grown dramatically since the 1990s, according to the National Collegiate Honors Council. While the Newark Honors College still hews to a relatively traditional approach, the Living-Learning Community is redefining from scratch what it means to be an honors student. HLLC admissions officers look beyond grades and SAT scores to students’ leadership qualities and their interest in the world around them. This is assessed first through group interviews where students are judged on how they collaborate with other students; the top 60 percent are then invited back for a one-on-one interview. Successful applicants have developed ideas for alleviating social problems and have volunteered in their communities, Rutgers officials say. The HLLC students, who number roughly 160, come from varied backgrounds. They range in age from their teens to their late 40s; some have served time in prison, and many balance their studies with family obligations. Roughly half are African-American or Latino, and about two-thirds are from the greater Newark area. “We really are sensitive to the need to stop overlooking students from Newark,” said Timothy Eatman, dean of the Living-Learning Community. 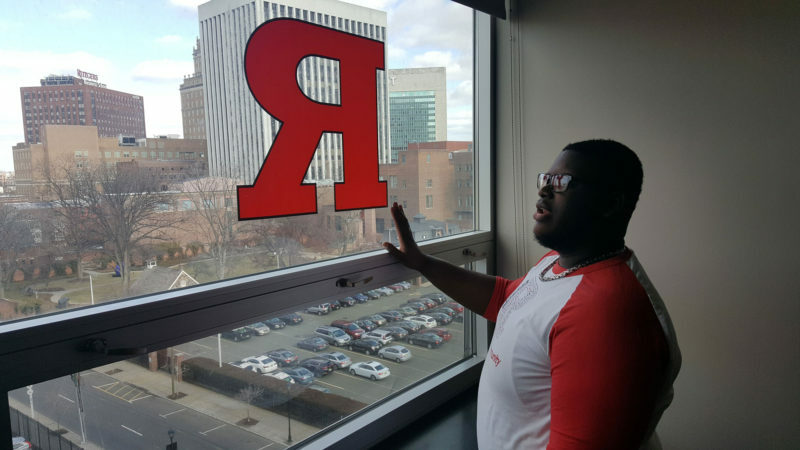 Roughly half the students at Rutgers-Newark’s’ Honors Living-Learning Community are black or Latino. Once admitted, students receive a scholarship that covers their housing and meals. Residing on campus with their peers is obligatory. For now, students live in a handful of dorms across campus, but a new building to be opened next year will consolidate living spaces and classrooms in one location. The new HLLC facility — financed through bonds and by a developer who plans to add stores and restaurants to the building — will also include a handful of suites for students with families, according to Engelbert Santana, the program’s assistant dean of advisement. After the building’s completion, the HLLC will be able to expand to at least 400 students. Living-Learning students participate in what amounts to an intensive, interdisciplinary minor. All of the program’s courses revolve around a central theme: local citizenship in a global world. Classes, which combine liberal arts and a focus on careers, might examine topics such as Newark’s history or residential racial segregation, or teach students about marketing for nonprofit organizations. Students must complete a final research or service project on social inequity in a local community — preferably Newark. Saied Beckford, an 18-year-old majoring in economics and computer science, lives on the seventh floor of a residence hall that houses many HLLC students. After moving with his mother from Jamaica three years ago, he graduated from a 1,600-student public high school in nearby East Orange. Like other Living-Learning students, Beckford plans to spend his career fighting for social justice. He uses the argot of advocates and do-gooders, calling himself an aspiring “change agent,” a term mentioned frequently by HLLC leaders and students. Eventually, he’d like to serve as either the U.S. Treasury secretary or chairman of the Federal Reserve, and influence economic policy from within the system. Related: These colleges turn low-income students into middle-class earners — but how? At the nearby Honors College, a different flock of students is also trying to boost the Newark campus’s prominence. Miriam Ibrahim’s parents told her she could apply to any college she liked, as long as it was within commuting distance of their home in Livingston, New Jersey. In exchange, they promised to help her pay for grad school anywhere she wanted. Ibrahim, a Coptic Orthodox, was impressed by Rutgers’ financial aid offers and its vibrant Coptic Orthodox community: She chose the Honors College. Although the college has existed for decades — it first graduated students in 1973 — its new leader is trying to ensure that Honors College students like Ibrahim are part of Newark’s revival. The college admits students based on their academics, extracurriculars and essays. Most applicants must achieve a grade-point average of 3.5 or higher to qualify, but exceptions are sometimes made for students who show promise. Honors College admission previously was tied directly to a Rutgers scholarship based on standardized test scores, but the program tweaked the process to allow a broader range of students to apply. “What we’re trying to find are people who are curious and interested in taking control of their education,” said Brian Murphy, who started as the Honors College director in 2016. The nascent HLLC program is attracting interest from other campuses. One of its deans, for example, is scheduled to discuss the program as a “model for creating inclusive campus communities” at a national convention of student affairs administrators in March. Although the university is examining HLLC data to see how its admissions policies are working, Santana said early returns are promising. HLLC students earned, on average, a 3.2 GPA he said, and all are performing at least as well academically as their non-HLLC Rutgers peers. Matt Krupnick is a New York Times contributor and freelance journalist.